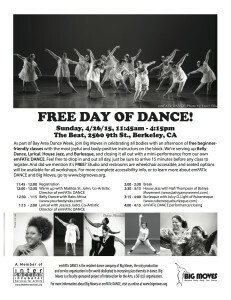 As part of Bay Area Dance Week, join Big Moves in celebrating all bodies with an afternoon of free beginner-friendly classes with the most joyful and body-positive instructors on the block. Stay tuned for more details as we have them! 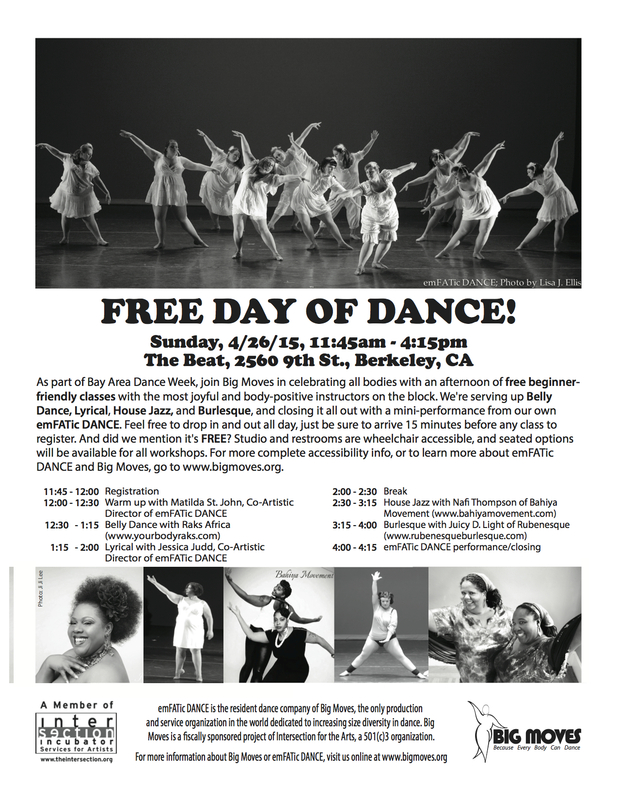 As part of Bay Area Dance Week, join Big Moves in celebrating all bodies with an afternoon of free beginner-friendly classes with the most joyful and body-positive instructors on the block. We’re serving up Belly Dance, Lyrical, House Jazz, and Burlesque, and closing it all out with a mini-performance from our own emFATic DANCE. Feel free to drop in and out all day, just be sure to arrive 15 minutes before any class to register. And did we mention it’s FREE? Please note: We are asking people who want to do the warm-up to please arrive at 11:45 for registration so we can start right at noon. Please wear clothes you are comfortable moving and sweating in and bring water to drink. Accessibility notes: There are no stairs to get into The Beat and none inside the studio. The dance studio itself, lobby, and bathrooms are all wheelchair accessible. The doorway to the dressing room may not be. Measurements on studio and bathroom doors is 35 inches wide. The dressing room is 30 inches wide. There is free street parking in front of the studio. There will be dancers demonstrating seated adaptations for all movement taught throughout the day. In order to make this event accessible to as many people as possible, we are requesting a low-scent environment–please refrain from using scented body, hair, or laundry products prior to attending. Please note that we are one group of many who rents this studio and it is part of a shared office building with shared bathrooms; we are unfortunately unable to control the type of soap in the bathrooms and cleaning products used in the space.